Sony unveiled its first Ultra HD Blu-player for the U.S. market in the UBP-X800, which was first announced at CEDIA Expo last September. 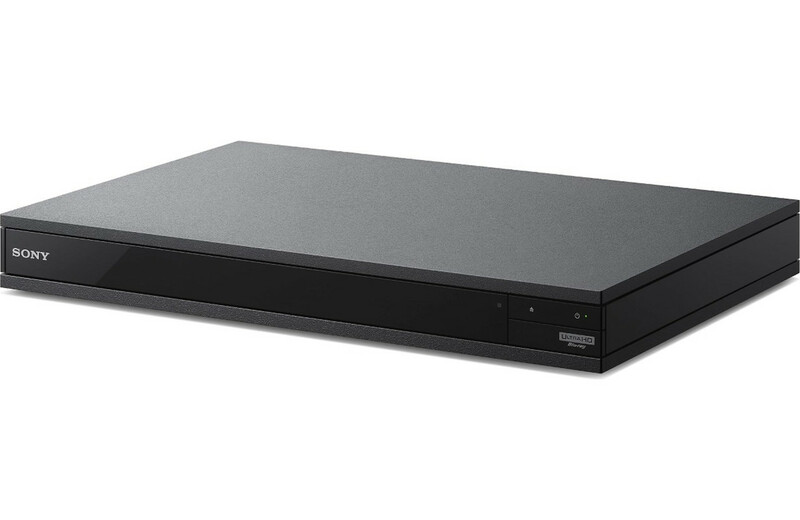 The UBP-X800 4K Ultra HD Blu-ray player is Sony’s first offering in the new player category. It is compatible with a wide range of disc and audio and video formats, and will offer video streaming in 4K resolution and HDR, for greater detail, brightnes and contrast. 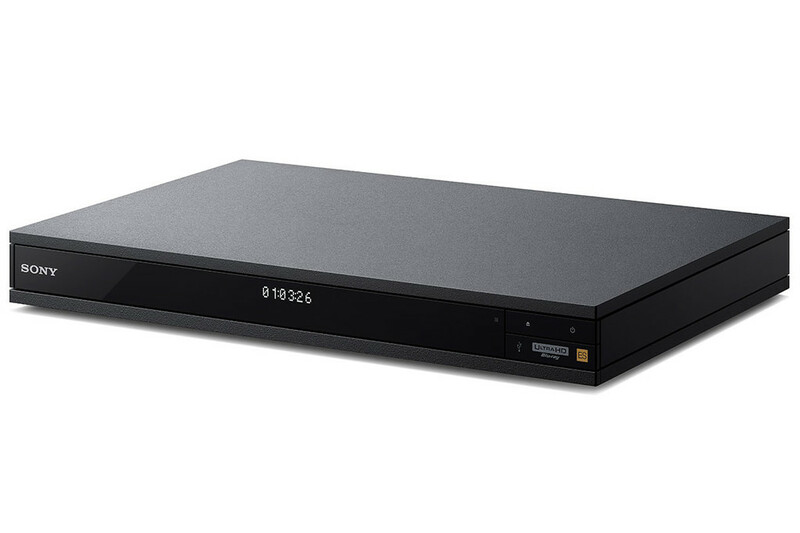 The UBP-X800 provides Ultra HD Blu-ray playback with a wide color space (up to BT-2020 for supporting displays when they arrive) with twice the color range of existing Blu-ray discs and players. The UBP-X800 will also support Dolby Atmos and DTS:X object-audio when connected to compatible receivers. The UBP-X800 features a Precision HD drive for consistent performance with virtually every optical disc format, including DVD Video and DVD Audio; CD and Super Audio CD and Blu-ray 3D, and BD-ROM media in addition to digital files stored on USB devices. Other features include a solid frame and beam (FB) chassis that increases structural rigidity and its honeycomb top plate. Hi-Res Audio support extends to playback of up to 192kHz/24 files and DSD 11.2MHz (via a forthcoming firmware update). For standard resolution music DSEE HX upscales the original signal’s sampling frequency and bit-depth. Integrated Bluetooth enables using wireless headphones while the sound can continue to play from the TV for the rest of the family in the room. The player will support a wide range of video codecs for 4K streaming services, and includes video processing that upscales SD and HD content to near 4K resolution. The player will even enhance 4K HDR content when played on a 4K SDR television, Sony said. 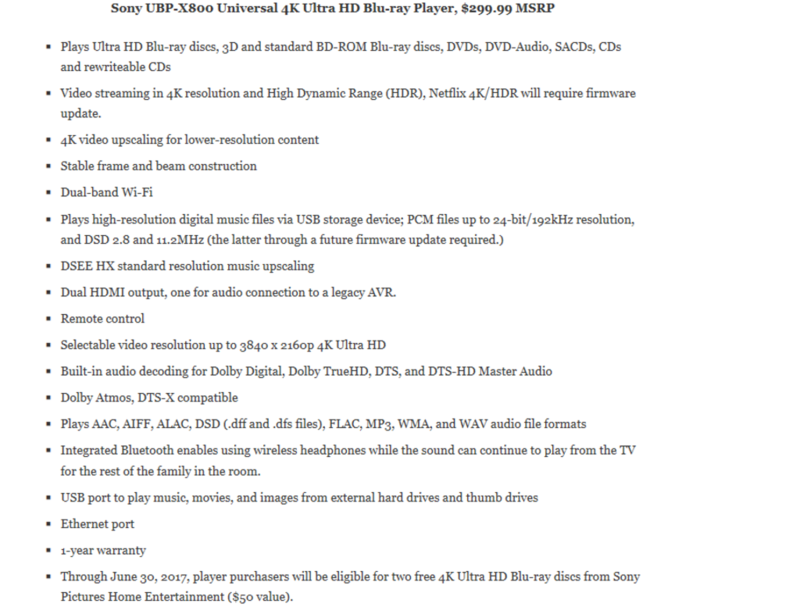 Sony said the UBD-X800 will be availabe in the spring at a price to be announced later. this player shows a digital display clock in the front, yet specs shown on other sites say no display in front like the Samsung player last year. Are you referring to the photo in the first post? Last edited by Lee Stewart; 04-04-2017 at 01:19 AM..
Read a Amazon review on the UBP-X800. The person said that it worked great for a while then started having playback issues, the replacement unit also started showing the same issues after a short time. Was this guy just unlucky or is there something wrong with this players design? I have the Sony UBP-X800 and it has worked great, too bad it can't handle Dolby Vision but that means it was available at a budget price. It does handle SACD and DVD-A, I still have a few hundred of those tiny niche market audio discs.